Priceline.com is an online travel agency that helps travelers save money and obtain deep discounts on flights, hotels, cars, vacation packages and more. With the creation of the Name Your Own Price tool and The Priceline Negotiator, they quickly became a go-to favorite for consumers worldwide. Get up to 80% Off standard prices from Caribbean cruises, Mediterranean cruises, and more. Minimum age requirements may apply. Get up to 40% off Flights. Get an extra $15 off Express Deals Hotels, Flights or rentals Cars. Travel any time. Book by 12/30/2018. Get an Extra 7% off Express Deal Hotel. Valid Only On 3 Star hotel Or Greater. $10 off your Express Deals Rental Car purchase when you spend $150 or more. Not combinable with any other offers or cash back. Get up to 60% Off Vancouver, British Columbia, Canada Hotels. Save up to $500 on Mexico Vacation Packages from $620 per Person. Enjoy sand, sun and tequila when you book your package. Check out these great deals. Get up to 40% off Beachfront Resorts in Cancun & Riviera Maya. Save up to 60% on Boston Hotels with the Name Your Own Price tool! Limited time only. Find & Save On Your Next Stay In Las Vegas! Find Great Deals On Flights, Hotels, Cars, Vacation Packages & More! Book Your Trip Today. No coupon needed. Get the best Chicago hotels deals with Name Your Own Price & Express Deals. Plan your next getaway to Chicago today! No coupon code needed. Save up to $500 when you Book with an All-Inclusive Vacation Package Deal. Save up to 34% in San Diego + Free Breakfast, Internet, Parking + More at Select Hotels. 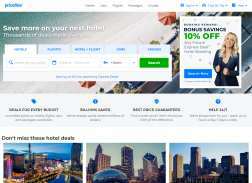 Get up to 60% Off Toronto, Ontario, Canada Hotels. Get up to 35% Off 7 nights or more when you stay at one of our spectacular deluxe on-site hotels at Universal Orlando. Get up to 60% Off Montreal, Quebec, Canada Hotels. Earn 10,000 Bonus Points after first purchase with Priceline Signature Visa Card. No Annual Fee. No foreign transaction fees. Earn up to 5x points on purchases and get 10% points back every time you redeem points. Experience Las Vegas Strips Ultimate All-Suite 5-Star Resort, Hotel, and Casino & Book The Venetian from $119. Name Your Own Price! Save up to 60% on Hotels in or Near Los Angeles, CA. Get up to 50% Off Last-Minute Flights. Book a Florida Vacation Package with Flight + Airfare from $254/Person & Save up to $500 + Add Low-Cost Rental Car & Activities. Choose from Over 3,000 Marriott Hotels in 67 Countries. Book your next family vacation at a participating Marriott hotel and receive complimentary goodies available at check-in. Get 5% Off Your Express Deal Hotel. Available on 3-star Hotels or greater. Must stay at least 2-nights. Travel anytime. $30 off your Express Deal hotel subtotal of $400 or more. Only available on 3-Star hotels or greater. Must stay at least 2-nights. Not combinable with any other offers or cash back.